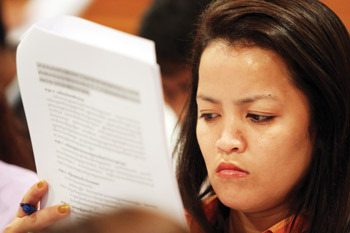 A woman looking at a draft version of a proposed Trade Union Law during a press conference on Tuesday at the Sunway Hotel in Phnom Penh. Unions called today for significant revisions to the draft trade union law and said they would consider striking if their recommendations do not make it into the law. The Cambodian Labour Confederation, the Cambodian Independent Teachers’ Association and the Cambodian National Labour Confederation were joined by several other unions, the American-based Solidarity Centre and the Community Legal Education Centre, in their criticisms of the draft law. They said their recommendations were made “in good faith” and there was still time for the government to consider much needed revisions. Unions argued the current draft would establish excessive and arbitrary state authority over the registration, dissolution and suspension of unions, resulting in a curtailment of workers’ rights. The groups expressed particular concern about provisions that would prevent anyone with a criminal conviction from serving as a union leader. Unions themselves could be suspended if three union leaders or members are convicted of crimes, even ones unrelated to the draft law, if the Ministry of Labour or an unspecified “third party” files a complaint. “This law is intimidating,” said Ath Thorn, president of the Cambodian Labour Confederation. The draft law also includes a number of penalties for violations of its provisions. “Excessively punitive articles open the way for employers, industry and government to destroy or severely damage the independent union movement and its individual members through financial means linked to violations,” the groups said in comments on the draft. Oum Mean, secretary of state at the Ministry of Labour, and Sath Samoth, undersecretary of state, could not be reached for comment today. The government has said it would submit the law to the International Labour Organisation for comments before sending it to the Council of Ministers. Ken Loo, secretary general of the Garment Manufacturer’s association, said the criminal penalties should remain in the legislation. “If the law doesn’t come with any punishment, then what’s the use of the law?” Loo said. “For example, in Singapore, where I’m from, there’s capital punishment for murder,” he added. Nevertheless, Loo said GMAC had agreed to a revision that would only prevent people from serving as union leaders if they had a recent conviction. He pointed to other areas of common ground. The law would allow the largest union in a factory to gain “most representative status” and the right to bargain on behalf of all workers in the factory, a significant change from current practice, which allows only unions with more than half of the workforce to do so. Both unions and GMAC said they favoured the status quo. Rong Chhun, president of the Cambodian Independent Teachers’ Association, said only “yellow”, government-aligned unions would be left if the law passes without significant changes. He said his union was willing to strike over the issue, as did Morm Nhim, president of the Cambodian National Labour Confederation. David Welsh, country director for the Solidarity Centre, said the government could choose a less confrontational path. Welsh said trade preferences with the United States – where two-thirds of the Kingdom’s garments were shipped last year – depend on “genuine respect for labour rights”.